Vacuum condensers for steam turbines are usually designed at design conditions when all condenser sections are cooled identically with the flowrate of cooling water (or air for air-cooled condensers) and the same air inleakage in each section. A deviation from the design operating conditions occurs due to several causes, such as nonuniform cooling of the condenser heat transfer surface because of its fouling or a fan failure (in air-cooled condensers) and local air inleakage. To investigate condensation under nonuniform cooling conditions, a test facility simulating a condenser was constructed. It consists of two parallel channels. Nonuniformity of cooling in one of the channels was simulated by reducing the cooling water flow. There were regimes with steam feeding into air to model air inleakage occurring in actual condensing units. The experiments were performed in the condensation pressure range of pc = 8–20 kPa. The previous predictions suggest that installation of orifices with a low-pressure drop can reduce the condenser pressure in case of nonuniform cooling. The effect of orifices with different diameters on the condensation process parameters was studied in this test facility. It has been demonstrated that installation of the orifices facilitates a decrease in the condenser pressure with a cooling water flow rate through one of the channels less than 50% of the design value. A range of optimal orifice diameters for this experimental condenser model was determined. According to the experiments, the benefit of orifice installation is observed only in case of joint operation of the condenser with a volumetric degasser, such as a steam jet ejector. 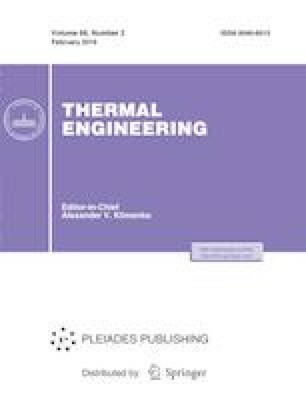 The experimental data demonstrate an increase in the efficiency of joint operation of a condenser and an ejector under nonuniform cooling conditions due to installation of orifices in the line of steam-air mixture ejection. This study was funded by the Russian Science Foundation (project no. 17-19-01604).